The four contestants, pre-mixing, on a rainy morning at the Wisconsin State Fair. Published Aug. 10, 2018 at 12:01 p.m. The Bucks Milk House, at the south end of the Wisconsin State Fair Park, right next to the Milwaukee Mile, has five flavors of tasty Wisconsin milk – chocolate, strawberry, root beer, sea salt caramel (introduced last year) and, new this year, mint – at the stellar deal of 50 cents a cup. 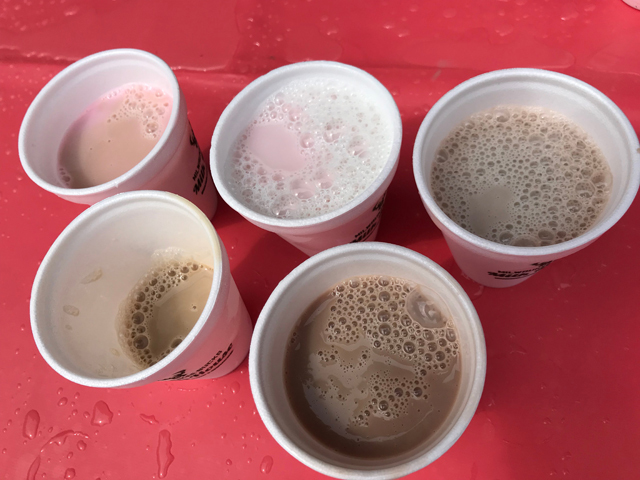 This year, the Milk House – which, before he sold the team and retired from politics, used to carry Herb Kohl's name (back then the milk was even cheaper at just 25 cents a shot) – celebrates three decades at the fair. During a recent visit to the State Fair, I plopped down my $2 to get samples of all but the root beer. I have no valid excuse for skipping that one other than that I just wasn't feeling it. That, and I didn't think it would work very well in my plan. My plan to mix the flavors and see which made for the best combinations. I'm told that you can ask the lattistas (I just made that up) to mix the milk for you and they will happily do it. Here's how a few of the combos looked. Mint and chocolate – this one, as you'd expect, is one of the best, hinting at the tasty mint chocolate chip custard at Kopp's. Mint and strawberry – Again, a great combo. Who doesn't love some chopped mint atop a bowl of fresh strawberries? Sea salt caramel and chocolate – The Ghirardelli folks know all about this winning combo. Sea salt caramel and strawberry – This was a pretty good blend, but not among the top finishers. Sea salt caramel and mint – I didn't think this worked very well, unsurprisingly. The two flavors just seemed to cancel each other out. As my cups began to empty, I notched it up a bit and started adding more flavors. Chocolate and mint and strawberry – This was a definitely a winner, perhaps taking the overall title, or at least tied with chocolate and mint. Sea salt caramel and chocolate and strawberry – There was too much going on here to really enjoy any of the flavors. Not gross. Just meh. Sea salt caramel and chocolate and strawberry and mint – You can guess how this turned out. If the combo of the first three flavors wasn't earth-shattering, adding the mint didn't help much. Very little beats the simple combo of chocolate and mint, though adding strawberry added a nice touch. What I really miss, however, is the banana flavor, which was both versatile and delicious. Please bring it back. And, next year, let's have malt, too (which Prairie Farms sells over in the Wisconsin Products Pavilion).